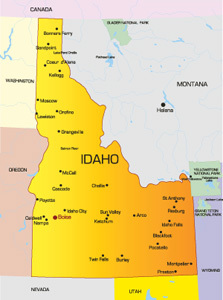 Idaho is the 39th most populous state in the United States and is home to 1,600,000 residents. It is bordered by Oregon, Washington, Nevada, Utah, Wyoming and Montana. The capital city is Boise which has a population of just over 200,000 people. The major highways servicing the state are I-15, I-84, I-86, I-90 and I-184. Other modes of transportation include major airports like Boise Airport the Spokane International Airport. There are many national parks that draw outdoor tourists and wildlife lovers to the state. These include California National Historic Trail and City of Rocks National Reserve. Several universities call Idaho home such as Boise State University and University of Idaho.